This is a navy blue Victorian blouse that my mother had dated at 1850, although it could be slightly younger than that- but I went with the tag she put on it with her initials. It is from a huge collection of antique clothing that my grandmother started in the 1920's. 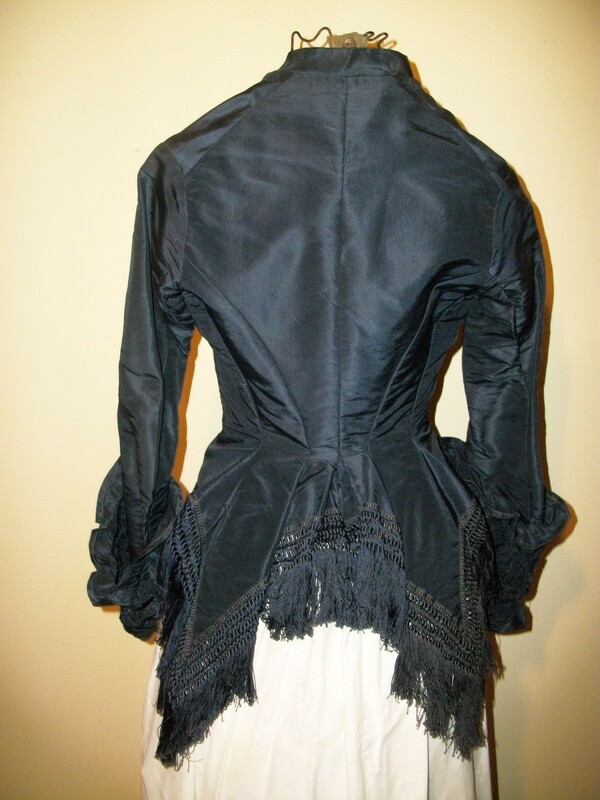 It is made of taffeta that is still soft and supple, not stiff and there is no breakage of any kind. The bodice has horizontal pleats that start all the way from the shoulder seam to the hem. It fastens closed with brass hooks and eyes and they are all matching, present and accounted for. 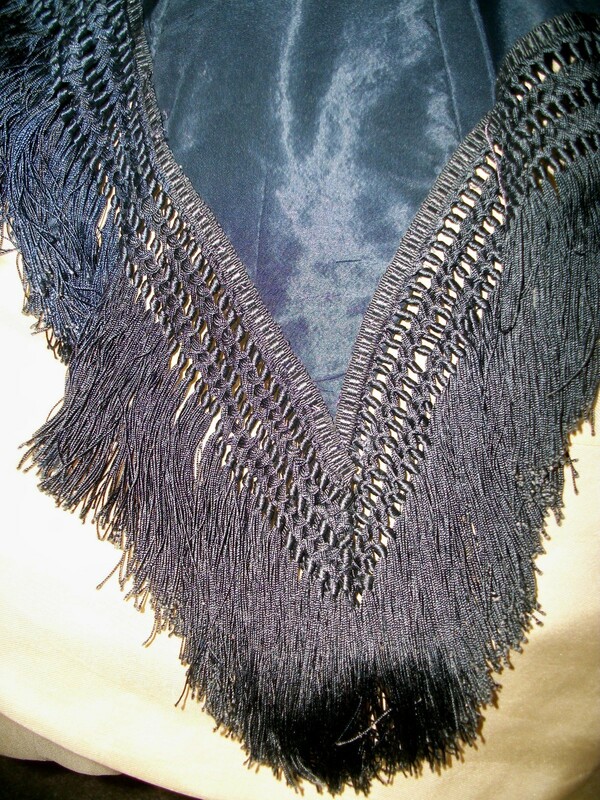 The bottom of the blouse is hand tied fringe and there is no fringe missing- totally complete. The sleeves are interesting, they are smocked and are 8" wide. The only real issue with the blouse is that this smocking should be reinforced. It looks like it was sewn with silk thread, which has not held up with the century it had to endure. All of the seams are tight and secure. I would have repaired it, but I sew like Roseanne Barr pole vaults... can't be done. 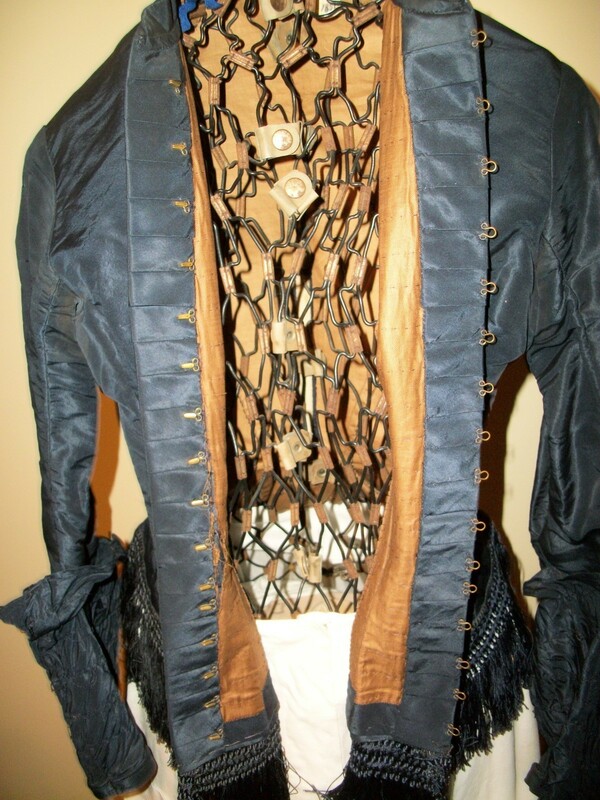 I found one pin point hole on the bodice I photographed for you, and I do mean pin point, and one near the dart seam. None other. 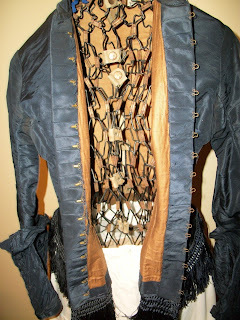 The lining of the blouse is done in heavy brown cotton and has no rips nor tears. 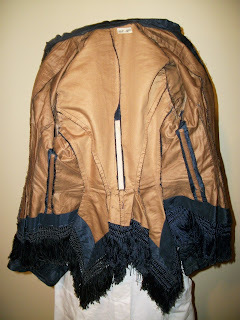 The boning in the waist is on both sides and the back. A great blouse from a long lost era. Bust- underarm seam to underarm seam 30"
top of shoulder to bottom of fringe- 24"
So very clearly not 1850's. 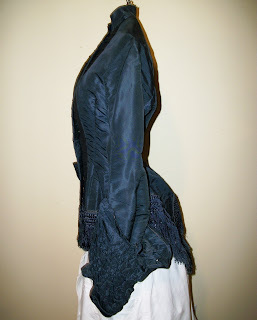 The entire style screams bustle era and the high neck along with the way the sleeves are set are very typical of the 1880's.